We are committed to sending you the best plants and seeds available. All of our plant items are carefully packaged and shipped to arrive at the proper planting time (depending on climatic conditions) for your area of the country. 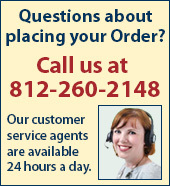 We ship plant items to the 48 contiguous United States. We do not ship plant items to Alaska, Hawaii, Puerto Rico, Guam or APO/FPO addresses. We ship general merchandise to the 48 contiguous United States. We do not ship to Alaska, Hawaii, Puerto Rico, Guam or APO/FPO addresses.